We hope that you’re doing well and enjoying some cooler weather with the autumn season. 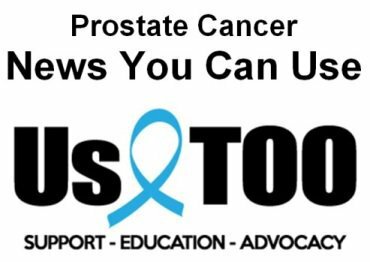 In addition to the following updates and information that may be of interest to you, prostate cancer news article titles are listed below along with a link to the Us TOO web page that provides access to the full text for each article. We were pleased to present the Prostate Cancer Pathways for Patients and Caregivers event and webcast in Englewood, NJ, on Saturday, September 29. Medical experts presented a brief overview of men’s wellness and health risks, including prostate cancer, followed by educational content for managing prostate cancer that’s newly diagnosed, recurring, or advanced, in addition to a presentation on sexual health and intimacy. Video from the event will be posted within the next few weeks. We’d like to thank all Pathways event attendees and sponsors, including local support group leaders, the online webcast audience, the team at Englewood Health who hosted the event, and presenters Dr. Anne Katz, Dr. Stacy Loeb, Dr. Charles G. Drake, Dr. Mazyar Ghanaat, Dr. Tracy Scheller, Mark Van Buren; and event sponsors Janssen Oncology, Bayer, Sanofi Genzyme, Astellas/Pfizer, Amgen, Genomic Health, AbbVie, and Augmenix. Please join us on Saturday, November 3, for the next Prostate Cancer Pathways for Patients and Caregivers event and webcast at NorthShore University HealthSystem in Skokie, IL. This free event will feature a special presentation from renowned expert and author Dr. Jeffrey Albaugh on the management of erectile dysfunction (ED) and incontinence related to prostate cancer treatment. REGISTER NOW to attend in person in Skokie or via webcast from anywhere with live audio and video. And get additional information on the new Us TOO web page on Sexual Heath & Intimacy and the new Us TOO web page on incontinence. Because prostate cancer can impact intimacy, it’s sometimes referred to as a “couple’s disease.” A woman may be subject to her own concerns in addition to those she shares with her husband/partner. A Forum for Her is a regular conference call series (and invitation-only Facebook group) from Us TOO which provides women with important peer-to-peer support. Calls are free and participants are not required to share their identity with the group. Get more information and join a call. Change Together, an online resource managed by the Astellas Stakeholder Engagement team, will be presenting a prostate cancer advocacy webinar featuring leadership from ZERO, PHEN and Us TOO discussing advocacy initiatives that address the needs of the community. The event is tomorrow, Thursday, October 11, at 10:00 am Central Time. Register for the webinar and post-event access to the recorded content. Patient Power is hosting a webinar, "Tools for Living Well With Prostate Cancer," on Wednesday, October 24 at 3:00 pm Central Time featuring Dr. Maha Hussain along with Nurse Practitioner Brenda Martone from Robert H. Lurie Comprehensive Cancer Center of Northwestern University. Register for the webinar and post-event access to the recorded content. In partnership with the National Alliance of State Prostate Cancer Coalitions (NASPCC), Cancer Care is offering a 15-week online support group for men currently receiving treatment for prostate cancer. Register or get more information. Cancer Treatment Centers of America® (CTCA) is partnering with the NFL Alumni Association to spread the word about the importance of prostate cancer screening. From September 1, 2018, to October 15, 2018, eligible men ages 40 and older may sign up for free or discounted prostate-specific antigen (PSA) tests at LabCorp locations in the United States. Get more information. The Medicare Open Enrollment period is from October 15 until December 7 each year. Access helpful information on MEDIGAP considerations and Medicare Advantage and Part D Prescription Drug Coverage.